I took some time off in November this year to visit Skye and Raasay for a late-season holiday with my wife, Rose. Never one to travel too far without my camera, I decided to put these words and pictures together in a mini photo-journal at the end of what has been a rather magical and unforgettable experience. 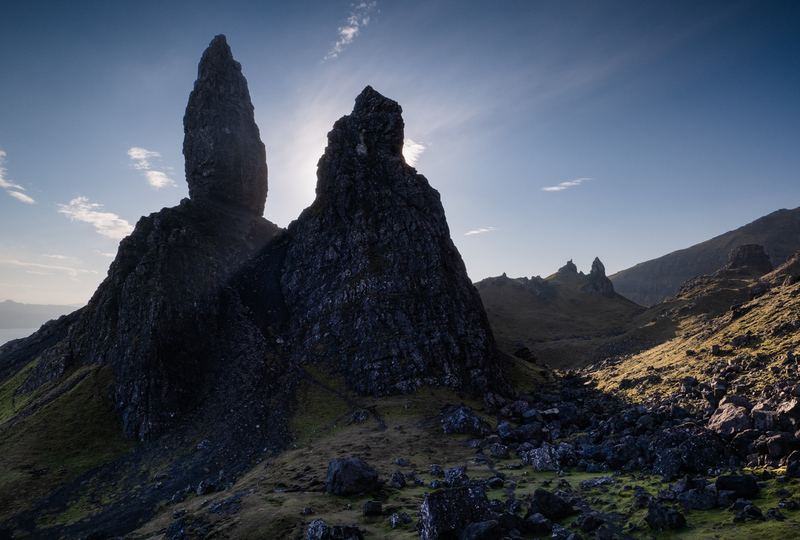 Although I was too young to remember the earliest trips, I know that I have been coming to Skye regularly since I was about two years old. 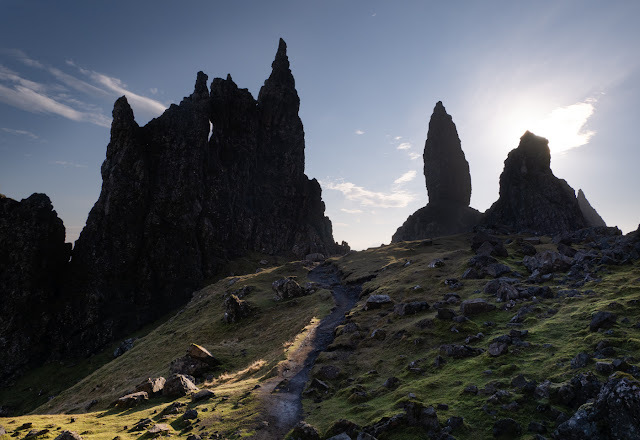 I think it is probably the Scottish island I have visited most, the other being Shetland, although I have definitely been coming to Skye for a good deal longer. All I seem to remember of the times when I holidayed here with my parents were the never-ending car journeys along tortuously-windy single-track roads which are now mostly all dual-carriageway. The same journey can now be made in a few hours rather than the full day I vaguely remember it used to take. For the younger me, the two great highlights of the journey were just the slim chance that I may glimpse the Loch Ness Monster from the road somewhere between Drumnadrochit and Invermoriston and the ferry journey from Kyle of Lochalsh to Kyleakin which was massively exciting. I really miss those old ferries! My father, Michael Marshall, worked as a producer in the BBC for many years. 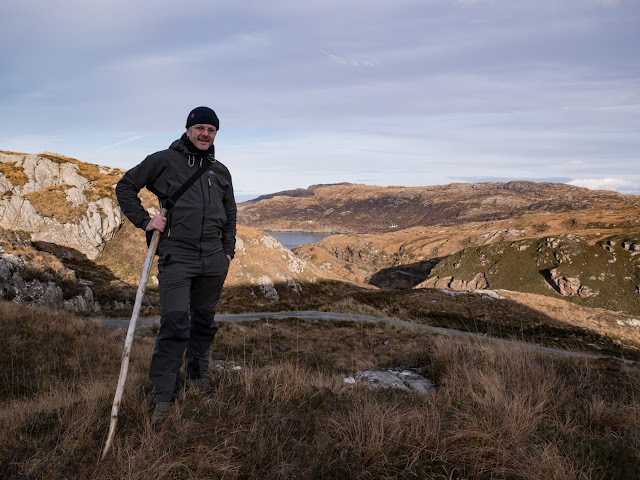 He was great friends with the late journalist and presenter Derek Cooper who spent a great deal of his time on Skye and who also wrote the gazetteer 'Skye' - its first edition published in 1970. Although it is now out of print, I think copies can still be found here and there (https://www.amazon.co.uk/Skye-Derek-Cooper/dp/0710068204). It was in the Skye town of Portree where Derek and his wife Janet spent their holidays and I faintly remember later trips to holiday with them. 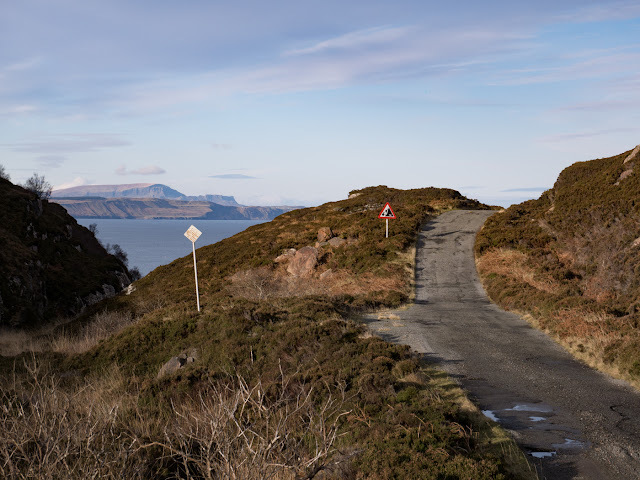 Day-outings to the west and Dunvegan or up to Trotternish and the narrow and twisty roads with rusty old cattle-grids and passing places on the way out to Staffin. 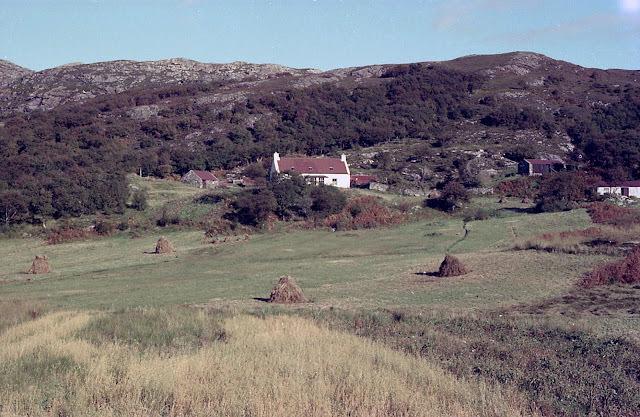 I seem to remember spending a bit of time up at places like Skeabost or Stein Inn, or going for lunch at the Cuillin Hotel in Portree, but probably not being allowed anywhere near the bar in those days! And I also remember making the walk to the local baker every morning except on the sabbath day of course, to collect wonderful, freshly-baked sugary doughnuts, usually accompanied by my mother or by my grandfather, Alec Marshall. A trip that I remember nothing of, however, was over to Raasay. I only know I have been here thanks to a series of wonderful photographs taken by my father and which I greatly treasure. 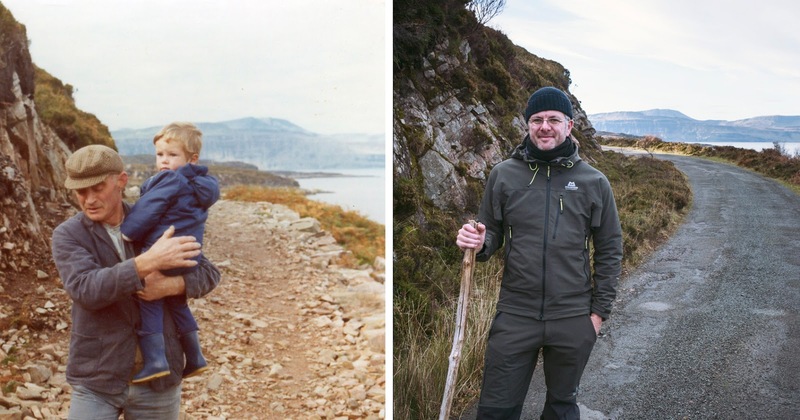 One of these photos shows a two-year-old Robert (Bob) Marshall, me, being carried by Malcolm (Calum) MacLeod in 1975 along a stretch of the now fabled road that bears his name and which he single-handedly constructed over a period of ten years between 1964 and 1974 with little more than a shovel, a pick and a wheelbarrow. I only came to realise the enormous scale of this man's achievement in my adult years and having read his compelling story written in 2006 by Roger Hutchinson (Birlinn. ISBN 978-1-84158-447-8). And it was around this time that my mother handed me the photograph of me being carried along the road by none other than the man himself in 1975 when I was two years old. Left: Calum MacLeod holding the young Robert (Bob) Marshall aged two in 1975. Right: Bob Marshall revisits Calum's Road in 2018, 43 years later. 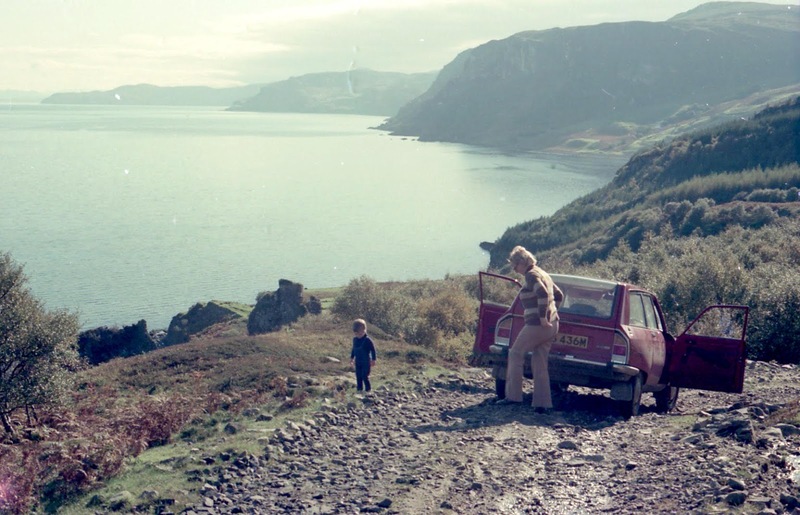 In 1975, my family visited Raasay as part of our holiday on Skye. 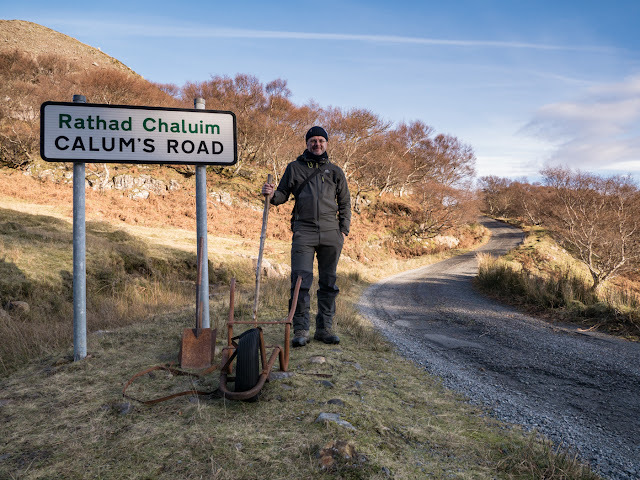 At this point, Calum had completed construction of his road and the photograph shows what I am thinking must be the final few hundred metres of this leading to his croft at Arnish. The road was not surfaced with tarmac until 1982 when the council finally adopted it but by then, Calum and his wife, Lexie, were the last remaining inhabitants of Arnish. Calum died in 1988. 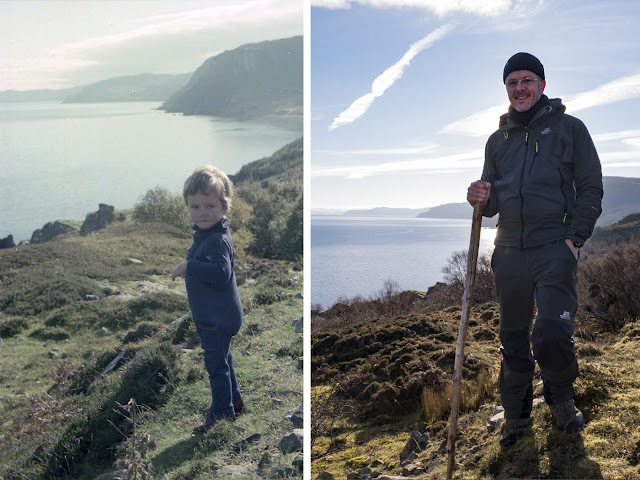 Since reading Roger's book, I had planned to visit Raasay to retrace my childhood footsteps and to walk the road that Calum built by hand. 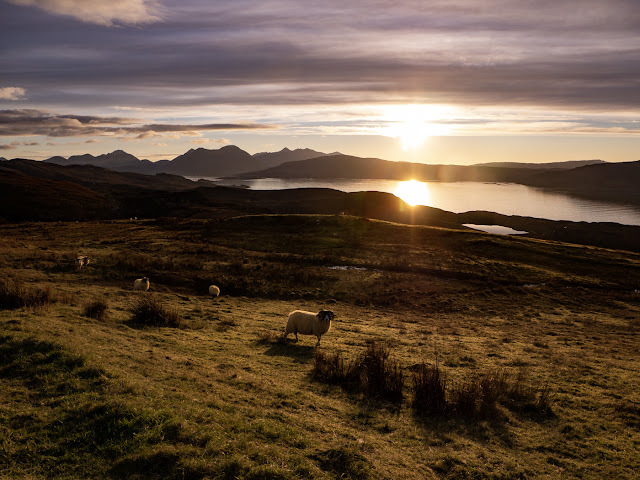 In November 2018, my wife Rose and I took a few days off from our busy schedule to visit Skye and Raasay for a belated summer holiday. We were astonishingly lucky to have been blessed with several days of excellent weather and I had some great opportunities to visit some fabulous castles (most of which I have visited before) and I also got to do a bit of walking too! 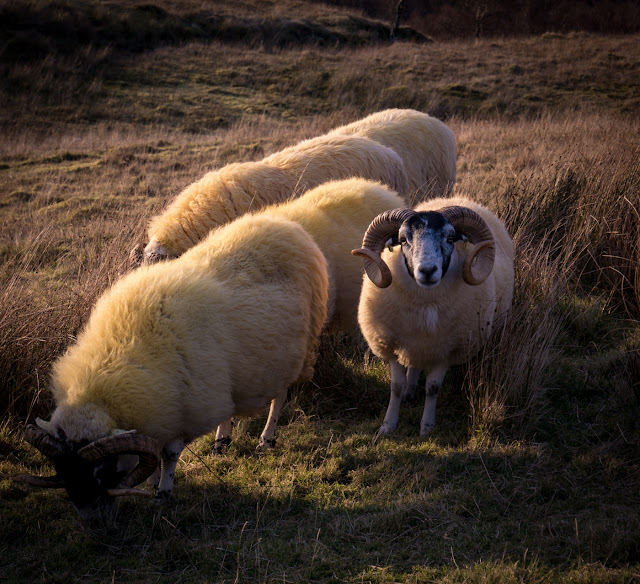 Rose's mother's surname is Macrae which is indigenous in the Skye and Lochalsh areas, as is the name MacLeod, and we believe that it is through Rose's grandmother's MacLeod name that, Calum MacLeod who built the road, may actually be a relation. So, Rose and I both had a shared interest in discovering more about Calum's background. She's been doing quite a lot of research in order to write a small book on her ancestry and much of our holiday was dedicated to tracing her family roots and connections which I found it extremely fascinating. It was wonderful to spend time with some of her relations and also to speak to a few local people who are extremely knowledgeable about the Macrae history and their genealogy. Our travels over these six days took us to Kintail and Eilean Donan Castle, Duirinish, Plockton, The Archives Centre at Portree, Kyle of Lochalsh and Raasay. 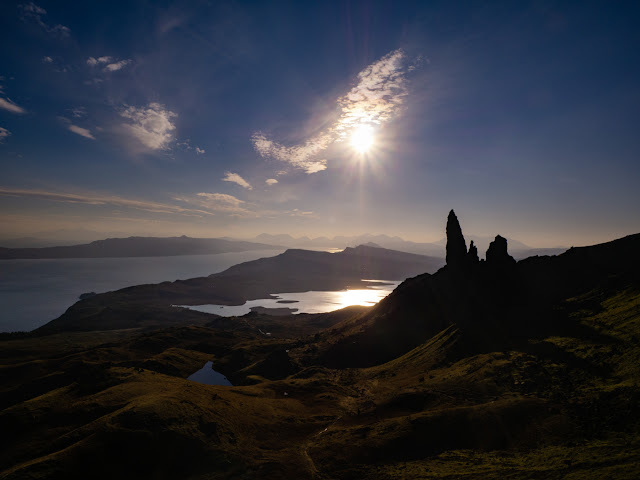 On the day that Rose spent in the Archives at Portree, I took a wee wander up to the Storr to enjoy perhaps one of the finest late autumn days I have experienced in recent years. With the sun out, it was pleasantly warm, but perhaps the most memorable experience was the absolute silence. There wasn't a breath of wind and it was just possible to make out the voices of people in conversation almost a kilometre away from where I was standing. The tall cliffs behind the Storr form a natural amphitheatre and amplifier making sound travel and reverberate over longer distances. This, combined with the sun casting interesting light rays through gaps in these cathedral-like rock spires, made it a rather spooky and magical spectacle. 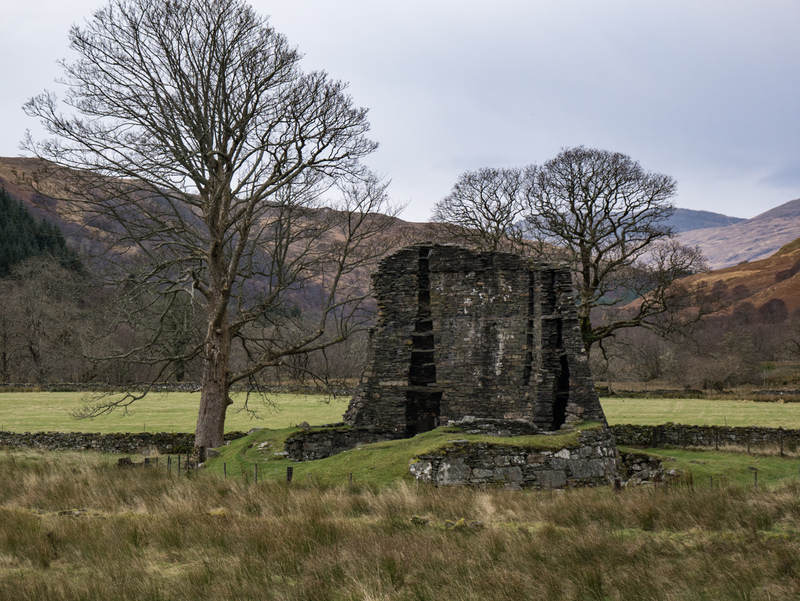 Although this was not part of our research, we took a trip down to Glenelg to see the two iron-age brochs of Dun Telve and Dun Troddan. These remarkably-intact structures are a fascinating glimpse into the ancient lives of our distant ancestors. I've visited a few brochs around Scotland, especially those in Shetland, but the Glenelg brochs are unique in their own individual ways and this was the first time I have had a proper chance to look at them in detail. On the same morning I paid a quick re-visit to Caisteal Maol (Castle Moil) at Kyleakin. 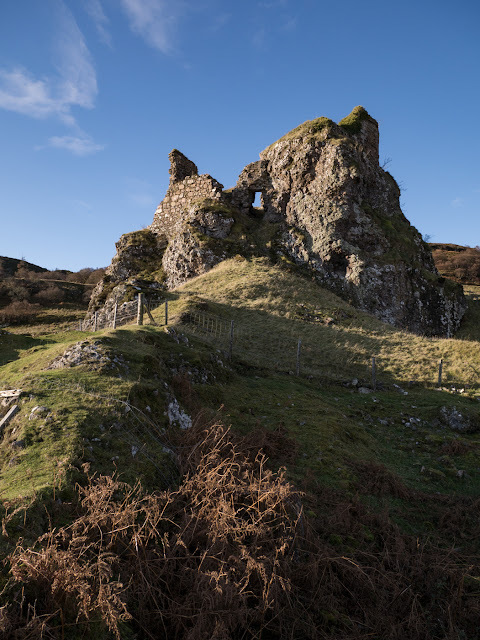 I last visited and photographed this castle in 2015, however in February 2018, the castle was struck by a bolt of lightning which destroyed part of the top half of the Northernmost remaining wallhead causing it to collapse. The ruin has since been stabilised to make it safe. The remains of the original wallhead now spill down the northern flank of the ancient dun on which the castle is built. It was interesting to note that the ruin has now been fitted with a lightning conductor! 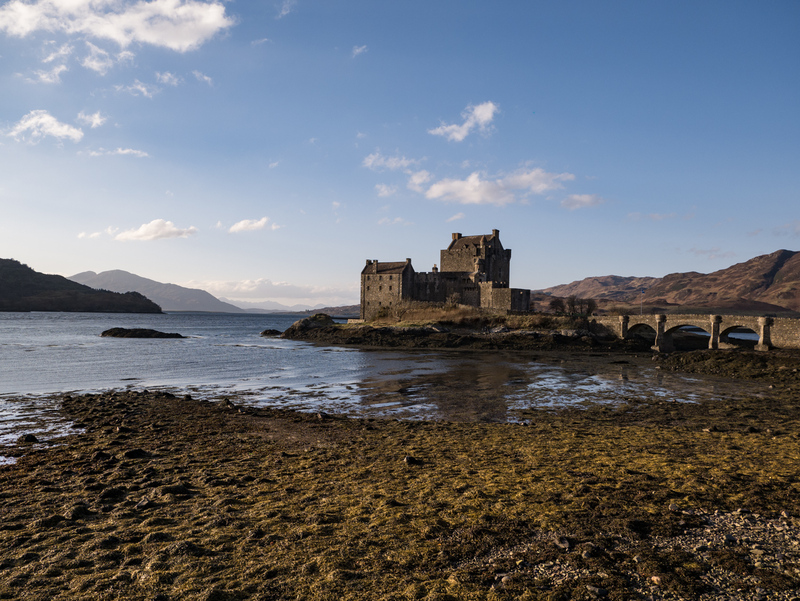 Left: Caisteal Maol, Kyleakin, Skye (2015). 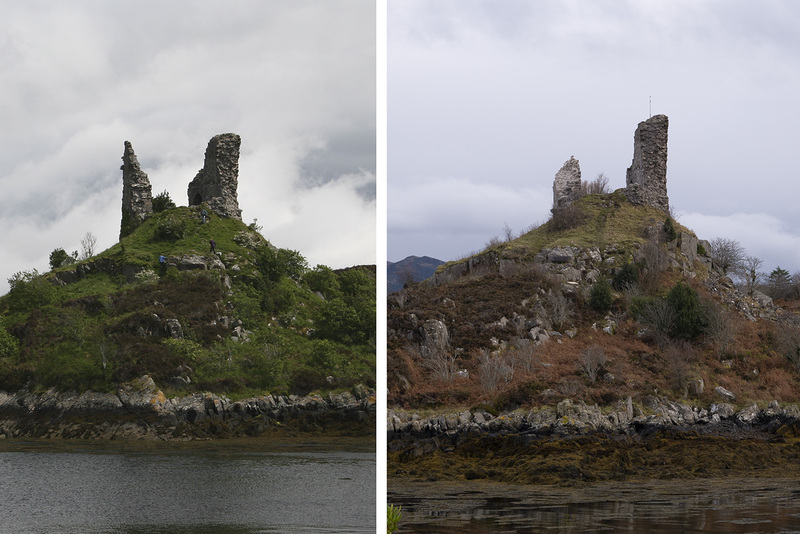 Right: Caisteal Maol, Kyleakin, Skye (2018) showing the extent of the damage caused by a lightning storm in February 2018. Our day over on Raasay started fairly early. 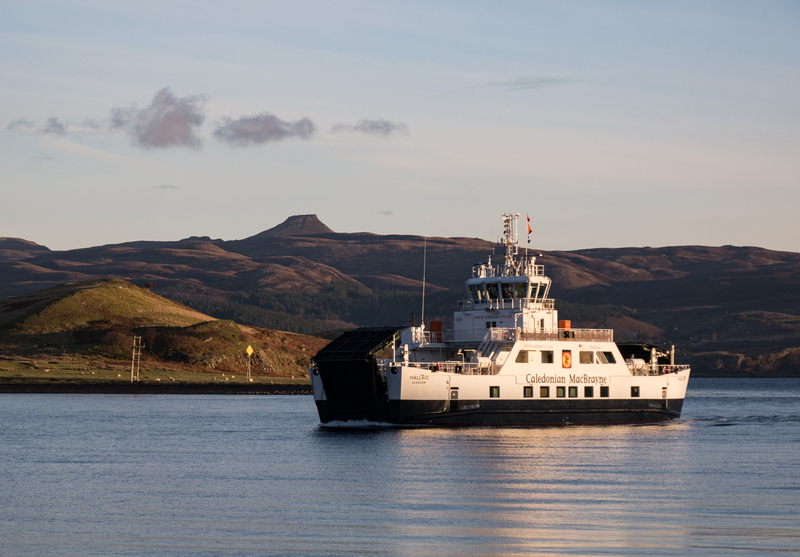 We picked the day that had the best weather and set out to catch the early ferry from Sconser to make the most of the available daylight. It gets dark very quickly, around about 4.30pm, at this time of year and we knew we had a lot to see and do while we were on the island. Our first objective was to walk the entire length of Calum's Road. Although we had taken the car with us and could perfectly well have driven the 1¾-mile road, I simply could never have lived with myself not having paid proper homage to Calum by driving it! I had to walk along his road in order to ponder on and savour his monumental effort - ten years of back-breaking labour. Our starting off point for the walk was Brochel. This is the site of a rather magnificent castle of the same name. What is left of this now ruinous late 15th/early 16th century stronghold clings perilously to a tall stack-like volcanic plug of rock. It is in a highly-dangerous state of disrepair and fenced off for obvious safety reasons. I decided that it would be for the best to take heed of the various notices posted around about the foot of the castle warning of falling masonry and imminent collapse. The entrance to the castle was originally on the eastern, seaward side of the castle. It doesn't look like it would be terribly difficult for an able-bodied man like me to scramble up and access the castle, but I don't think it would be wise to take the risk, nor indeed the chance that I may cause further damage to this fabulous ruin in attempting to access it. I much prefer to observe from a respectfully safe distance! 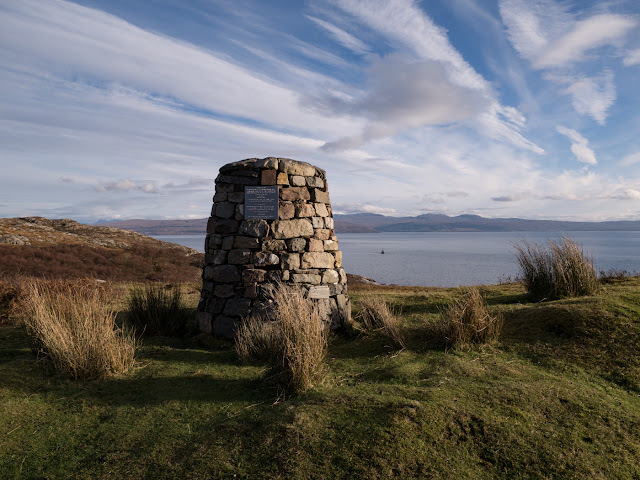 Brochel is located in a wonderful spot close to the beach affording fantastic views over the Sound of Raasay to the Applecross Peninsula. 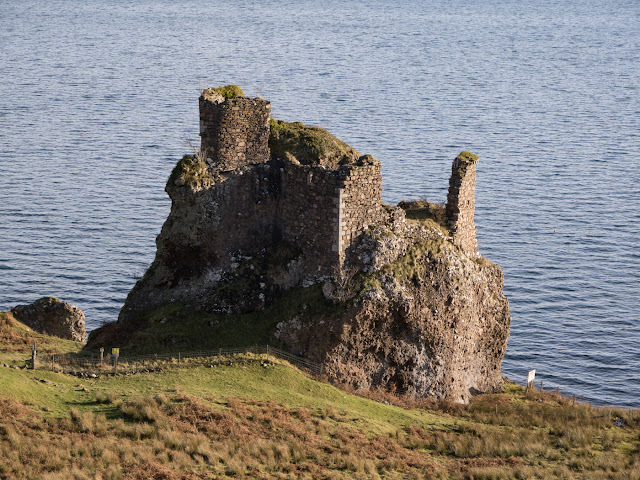 It is easy to understand why a castle was built here by Raasay's first Macleod chief, Calum Garbh or (later) Calum MacGilleChaluim, and afterwards occupied by the Macsweens. At Brochel begins the start of Calum's Road. Around almost every bend, kink, rise and dip in the road, there are indications that this marvel of road-building was no easy feat. Even for modern machinery, I would expect it would have presented quite a reasonable engineering challenge. That Calum managed to build this all this on his own, and the fact that later workmen had very little, if any remedial work to do to prepare this road for its tarmac surface is truly awe-inspiring. 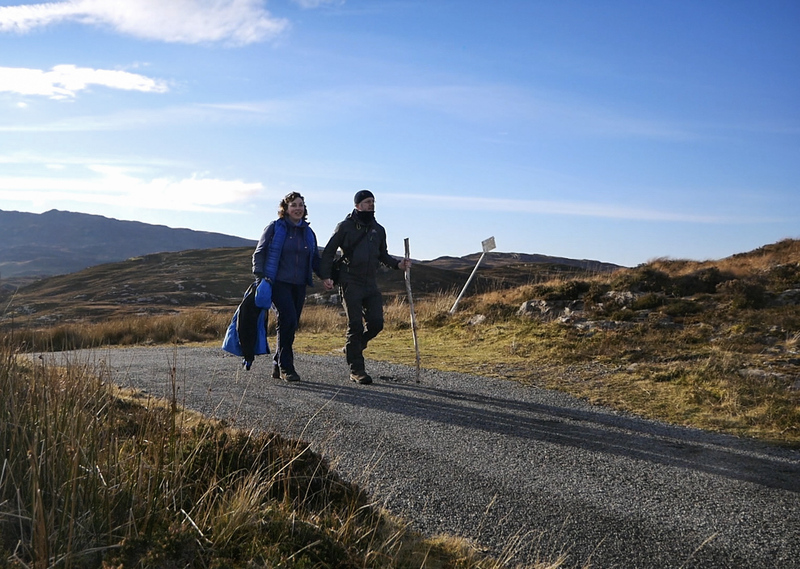 Our journey along the road that Calum built was made all the more special with the chance to meet with Calum's surviving daughter, Julia, who just happened to be staying at Arnish at the same weekend that we were visiting. It was a truly wonderful encounter and the chance for Rose to make a connection with the MacLeod side of her family. 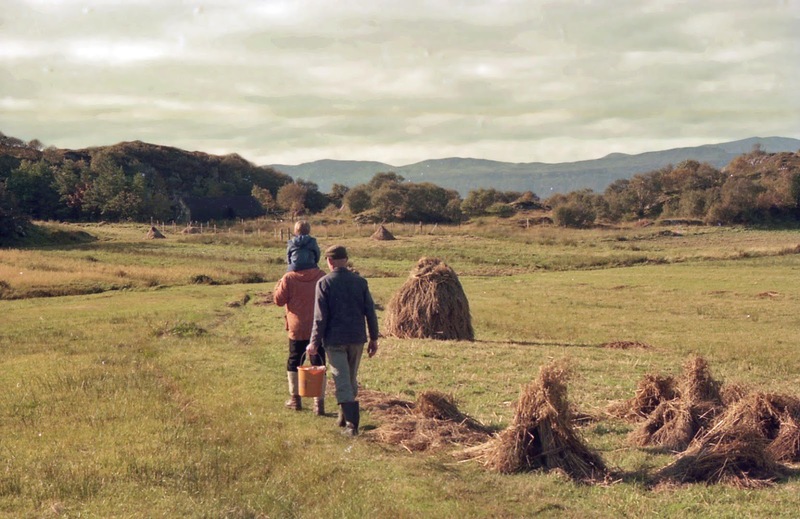 Left: Young Robert (Bob) Marshall on Calum's Road at Brochel 1975. Right: Bob Marshall on Calum's Road at Brochel 2018. Standing roughly half way along Calum's Road where the road drops steeply down towards a small inlet at the head of Loch Arnish. With thanks to my father for the use of the photos of Calum's Road and Arnish, 1975 and also to my lovely wife, Rose, for taking some of the photos of me and for being such fantastic company for the six days we spent up here. 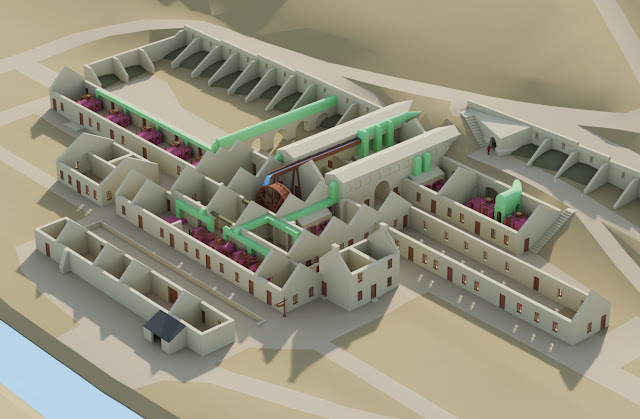 Final render: Reconstruction of the kitchens, Orford Castle. I thought I would quickly pen this article having recently run into some awkward problems while tackling visualisations of some extremely confined interior spaces. I am sharing this in case it may help or offer some pointers to anyone else tasked with a similar problem. I am using my reconstructions of Orford Castle in Suffolk, produced for English Heritage, as an example here. 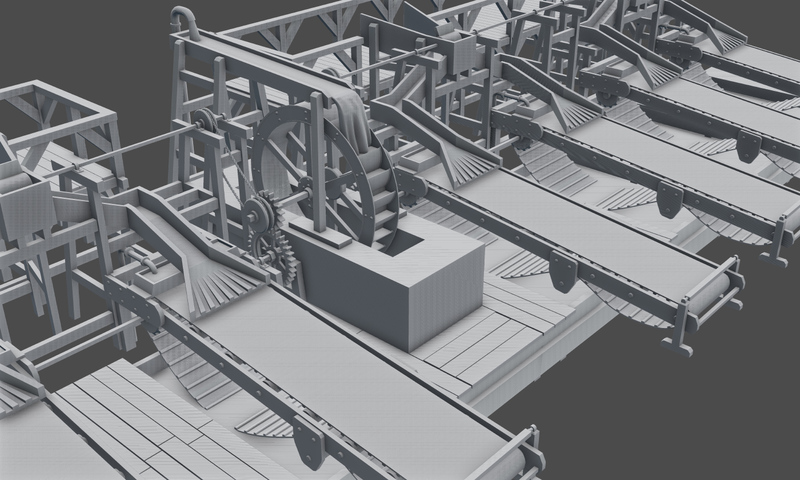 When setting up my 3D models in the Blender 3D software, the usual and most obvious way to fit most of the scene into the final image is to set a very wide angle camera lens. But the drawback with wide angle lens settings is that they tend to create a lot of distortion in the image which just doesn't look visually pleasing. So, I prefer to use longer focal lengths of between 40mm and 70mm but that means of course, that we won't get to see all of the room in the image. How did I tackle this problem, then? In Blender 3D, you can bend the rules somewhat. There are some nifty camera settings that emulate often prohibitively-expensive tilt-shift lenses which are used a lot by architectural photographers. Using a combination of camera rotation and adjusting the camera's X and Y shift values, it's possible to correct some of the distortion that comes with the wider angle lens settings. You can also play with the camera's sensor size and choose a setting that emulates a real full-frame camera - and even beyond that! But sometimes even this doesn't quite provide enough flexibility. So this is when it's time to roll out the big hacks. The scene needed to be accurately lit. Positioning the camera inside the room with a wide angle of view resulted in this extremely distorted and completely unsatisfactory image. I decided quite early on with this scene that choosing a wide angle lens wouldn't work here. What I needed was a way to position my camera at a distance just far enough away from my model that I could use a focal length of 60mm-70mm to avoid distortion and fit in as much of the prison's interior space as I could. 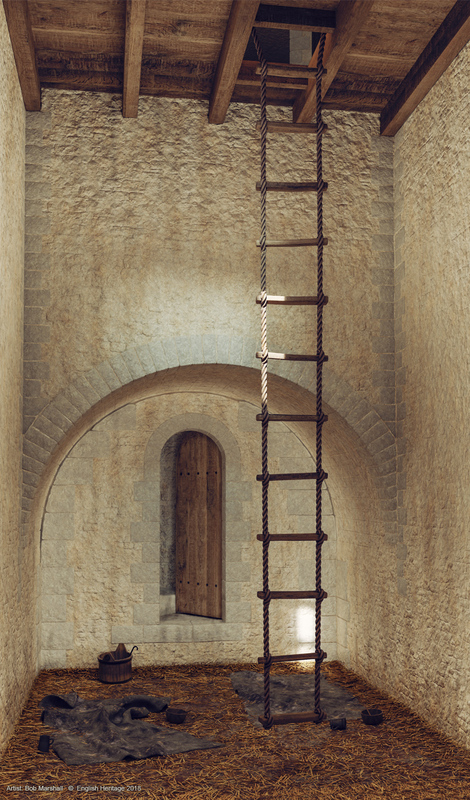 To do this I positioned my camera well outside of the model and set its image dimensions to 2500 x 5000 px which will produce for me a nice, detailed render of the full prison space. But now I have a wall with a backface obscuring the view of the prison's interior. It might seem like a straight-forward task of just deleting or hiding the wall in the scene, but the problem is that this hides the wall from both the camera AND the scene. The environment lighting that I have set up to illuminate the room (through a small window) penetrates the room through the void left by the missing wall, which is no good at all. 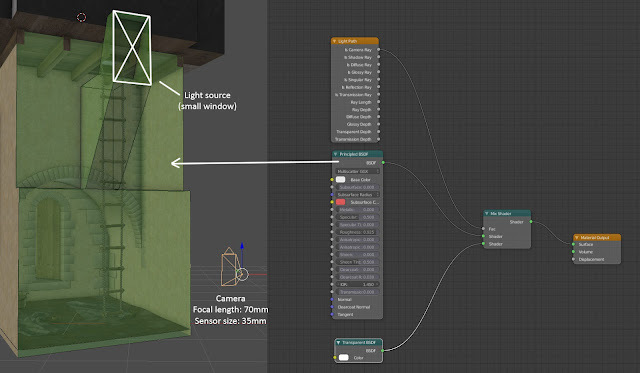 The surprisingly simple workaround here is to employ Blender's Light Path material node which controls what elements in a scene the camera will see in the render. 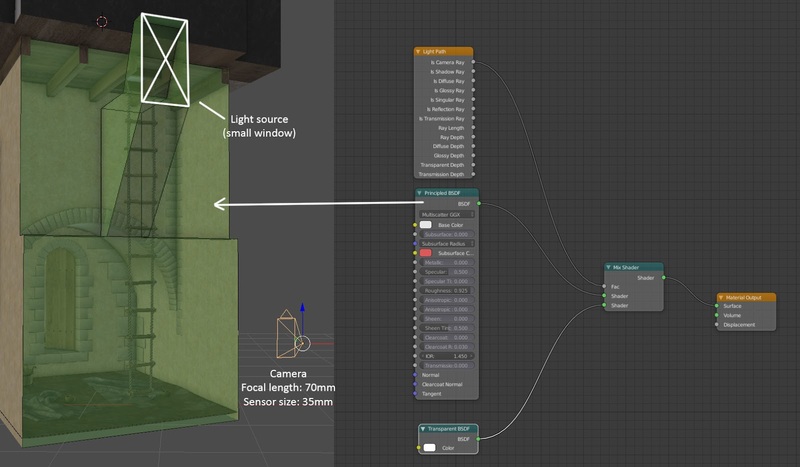 There are some good tutorials out there on the web which explain this very useful node in more detail, but for my example I am using the Is Camera Ray output of the Light Path node as the factor for mixing two of Blender's material shaders - the Principled and Transparent shaders. 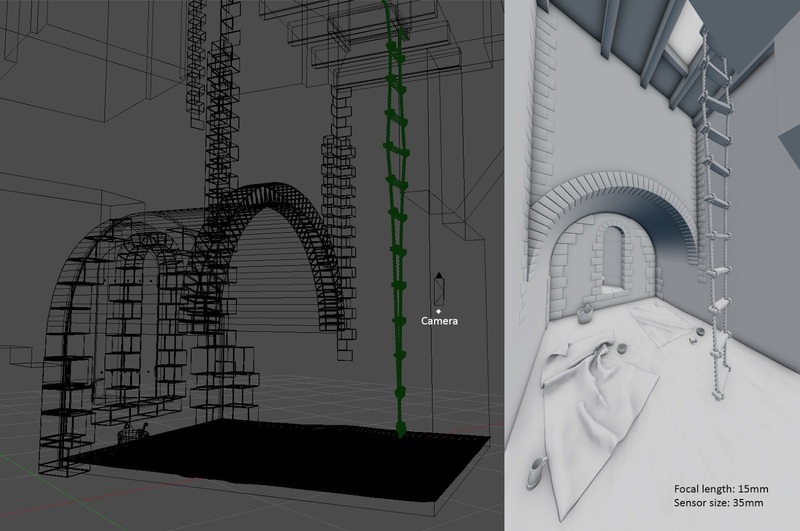 This is making the obscuring wall transparent or invisible to the camera, but still visible to the rest of the scene so that lighting can be calculated accurately. By positioning my camera some distance outside the room and using Blender's Light Path node to hide the backfacing wall from the camera, I could use a much longer focal length resulting in far less image distortion. The final result of the render. The Prison, Orford Castle. Accurately-lit and no ugly lens distortion! 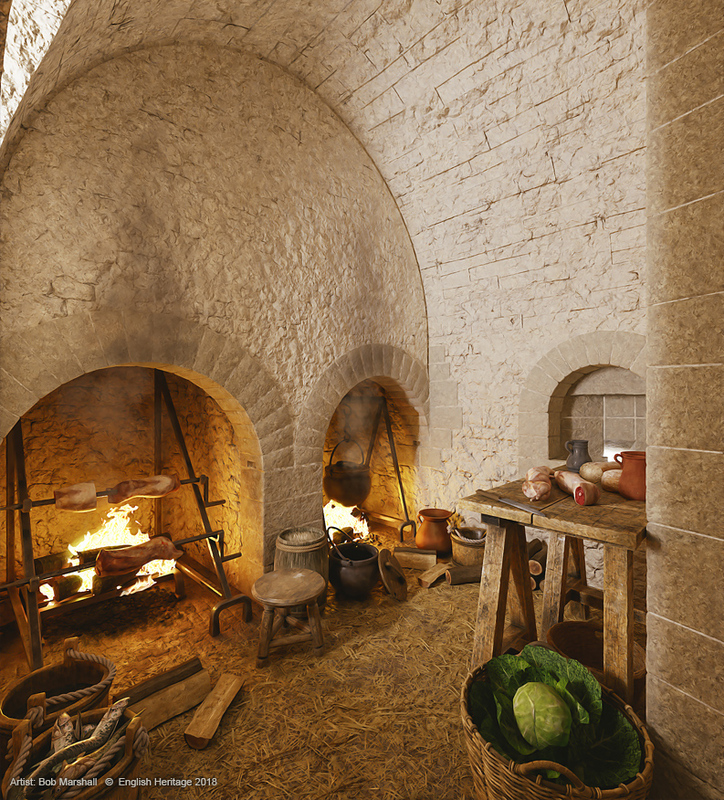 I used this same technique on Orford Castle's kitchens (image at top of page) - although in this example I did use a slightly wider camera focal length, with some distortion in the lower part of the image, it still gave some reasonably pleasing results. 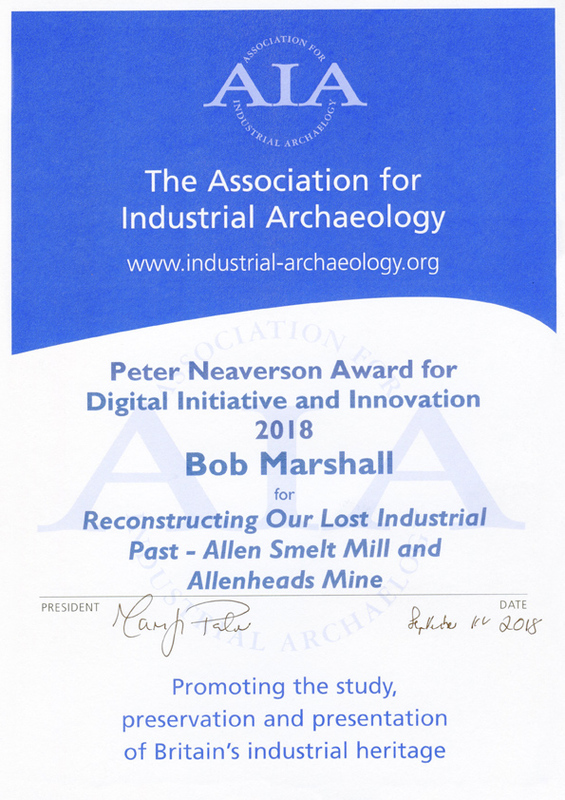 Two digital reconstruction images of Allen Smelt Mill and Allenheads Mineyard in the North Pennines have won the Association for Industrial Archaeology's Peter Neaverson Award for Digital Initiative and Innovation. The two reconstruction images were produced by East Lothian-based illustrator Bob Marshall for an industrial archaeology interpretation project in the North Pennines. 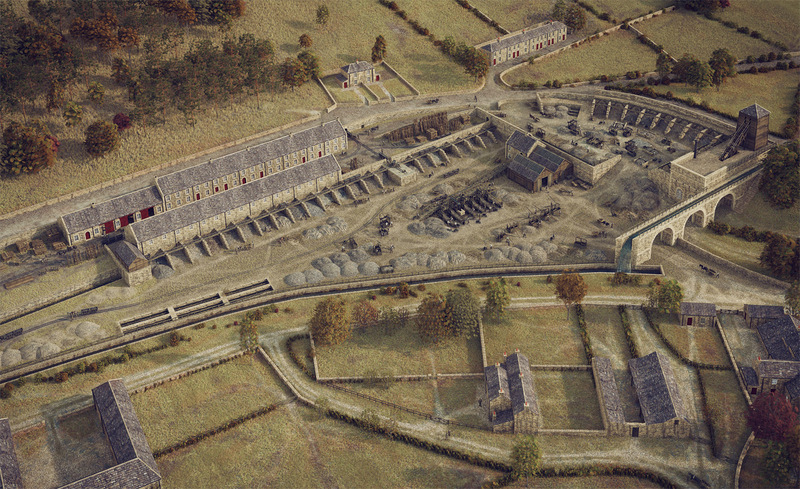 Bob specialises in producing high-detail visual reconstructions of historic buildings and monuments and was commissioned by Differentia Design in Hexham as part of their project for the North Pennines AONB Partnership to bring to life the history of the lead industry in the East Allen Valley in Northumberland. Bob worked with Tim Crump, a Hexham based interpreter and ex-archaeologist, to turn the scant records and remains on the ground into an accurate representation of two important Northumberland lead production sites at the height of the industry in the mid-nineteenth century, and the images are now displayed on interpretation panels helping to explain the workings of the former industrial site to visitors. The panels were produced in long lasting natural materials using Lavastone. This material was chosen for its longevity and robustness as well as it environmental credentials. At its peak in the 1850’s, Allen Smelt Mill was one of the largest lead smelting mills in the country and would have generated enormous wealth for the valley. The mill was demolished in the 1950s and 1970s and all that remains are flue openings, the ore hearths, the wheel pit and roasting furnaces which have only recently been uncovered. 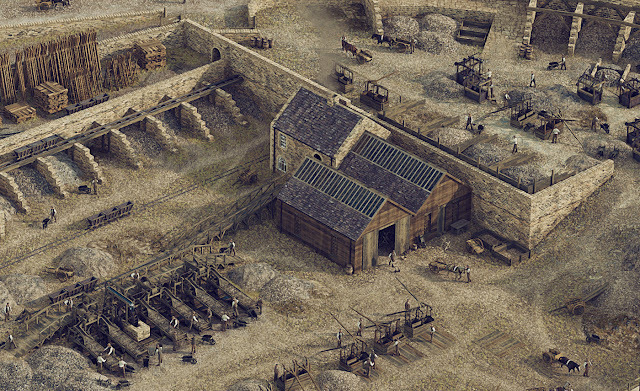 Bob’s approach to the challenge of reconstructing Allen Smelt Mill was to employ the use of three-dimensional computer models to help visually reconstruct the complex arrangement of buildings and flues. Bob worked closely with Tim Crump of Wildlight and Steve Pardue of Differentia Design, both based in Hexham, to develop the images and the interpretive panels. With only limited visual references to work from, they carefully researched the mill’s history by extracting what information they could from books, old plan drawings and from some local knowledge. The project took several months to accomplish, and it is one of the most technically-challenging visual reconstructions that Bob has attempted. To achieve it, it was necessary for Bob and Tim to understand the lead smelting and refinement process in detail - a subject which neither of them had much knowledge of before they began work on this project. The task was made more complex by the fact that only puzzling fragments remain of the smelting mill. 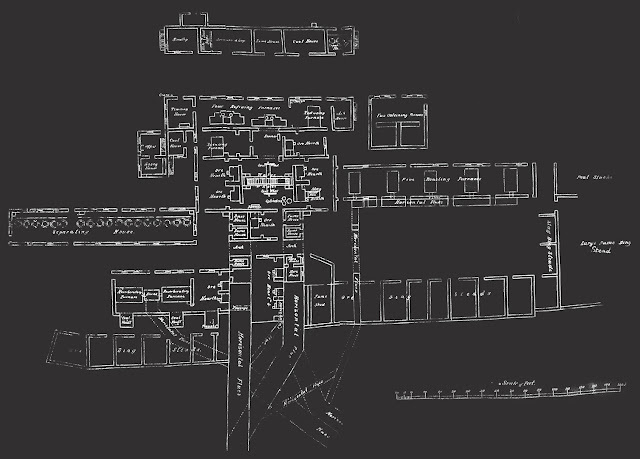 There are no records of its layout apart from a single plan drawing which shows its general arrangement and an indication of which refinement processes were carried out in the different buildings. Some guesswork had to be employed to try to visualise the arrangement of flues which carried the highly toxic fumes away from the roasting furnaces and smelting hearths and connected to two, horizontal chimneys which end high up on the moors above Allendale, over two miles away. The Peter Neaverson award for Digital Initiative and Innovation recognises the impact that developing digital technologies are having on our interpretation, dissemination and conservation of our industrial heritage and archaeology and is given to the creators of the work which makes the most effective use of digital technologies in industrial archaeology. 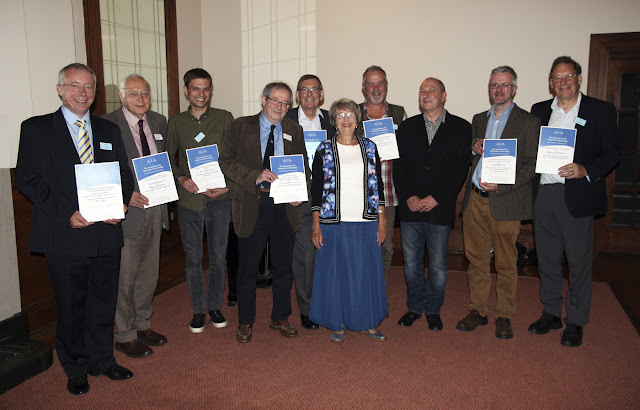 Bob Marshall and Tim Crump received the award at the Association for Industrial Archaeology’s conference at the University of Nottingham on 1 September and gave a short presentation explaining the processes and techniques they used to create the reconstruction visuals. The remains of Allen Smelt Mill today showing the remains of the flue openings. The remains of one of many refining furnaces. 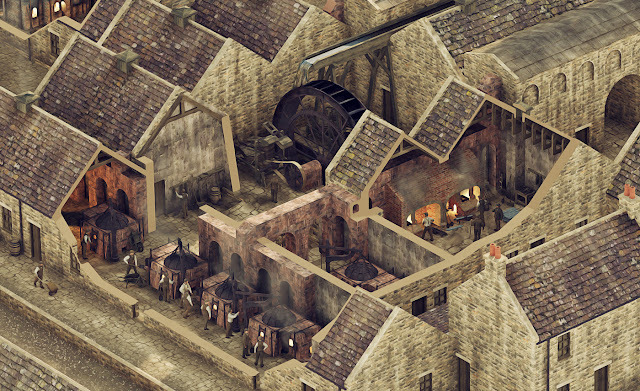 Computer 3D models were made to try and understand the mill's complex arrangement. Detailed 3D models were made of some of the major pieces of equipment on the two sites. These are known as 'buddles' and were used for washing the lead ore prior to refinement. AIA Prizewinners 2018. Bob Marshall (second) and Tim Crump (third) from right. At its peak, Allen Smelting Mill was a noisy factory full of fire, fumes and smoke. It is rather hard to imagine such a scene when you visit the site today. 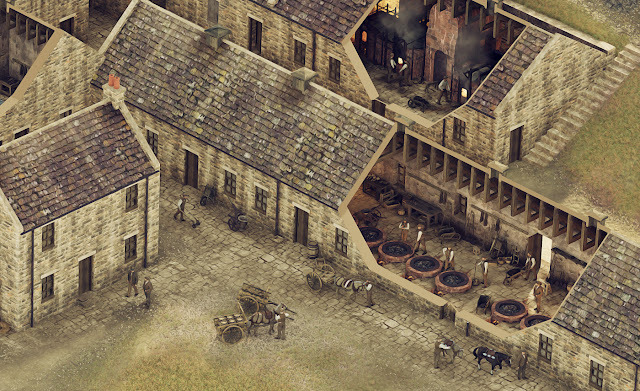 Only puzzling fragments remain of the mill which in the 1850s, was one of the largest in the country. It had the capacity to process over 2,000 tons of lead ore each year and would have generated enormous wealth for this valley. The Smelting Mill was demolished in the 1950s and 1970s. All that remains are flue openings, the ore hearths, the wheel pit and roasting furnaces which have only recently been uncovered. The flues can be described as long horizontal chimneys, which end at chimneys high up on the moors above Allendale, over two miles away. The flue system here is the best preserved in England. These illustrated reconstructions are the product of a close partnership between myself, Steve Pardue of Differentia Design and Tim Crump of www.wildlight.co.uk. With the help of local experts, we worked together to research and collate historical information from a range of sources including books, old photographs and drawings and written descriptions to help us reconstruct these two lead mining and lead processing sites. The task of reconstructing the lead smelting mill took us several months and is to date, one of the most complicated visual reconstruction projects I have attempted, requiring the use of 3D computer modelling to plot the locations of the various buildings, sheds and complex network of flues designed to carry the highly toxic lead fumes away from the site. This project required us to research and understand the lead smelting and refinement process which is a subject I had very little knowledge of before embarking on this project. Smelting and refinement was carried out in different furnaces at Allendale. Roasting would prepare the ore for smelting; ore hearths would ‘sweat out’ pure lead from the ore; slag hearths would re-smelt slag from the ore hearths; and silver was refined from lead in the separating house. 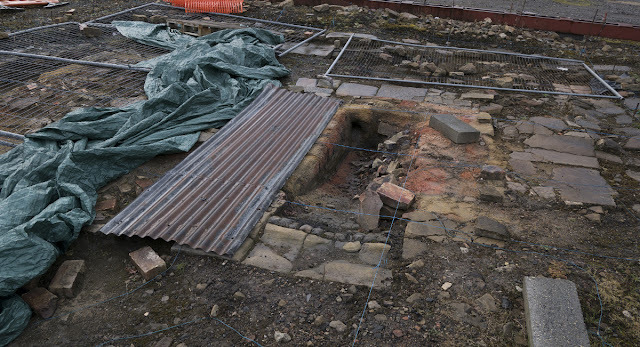 The lead ore or galena, was transported to this factory from lead mines across the North Pennines, including that of Allenheads just a few miles up the valley and which I have also reconstructed as part of this project. At the Allenheads mine yard, teams of men and boys operated jiggers and buddles to sift and wash the mined minerals in order to extract every available ounce of lead ore. The process required vast quantities of water. The ore was then taken from here to the smelting mill at Allendale on the backs of small, rugged horses known as Galloways, then deposited into storage bays here called bingsteads, where the material would then await refinement. First, sulphur in the lead ore was burnt off in the roasting furnace and this prepared the ore for smelting. A coal fire at the front of the furnace was kept separate from the lead ore by a brick shelf or a 'fire bridge'. Heat was drawn through the furnace by the flues at the back. A draught created by mechanical bellows powered by a giant central water wheel, kept the fires in the Ore hearths hot enough to slowly sweat the lead out of the ore. It provided the oxygen needed for the chemical processes to convert lead ore into lead. Tiny bits of the parent rock, including fragments of ore, were left behind as slag. This was crushed and smelted again in the slag hearths to recover any remaining lead. 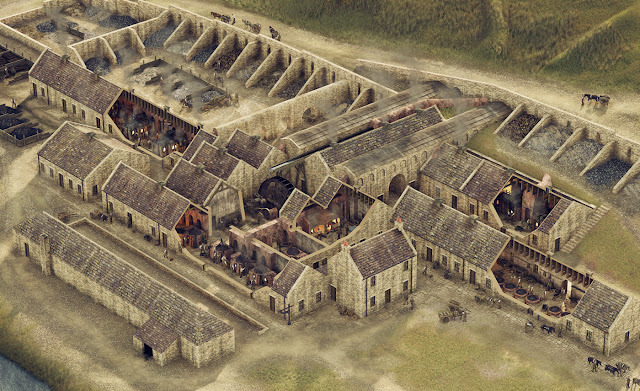 Illustrated reconstruction showing a cutaway view of Allendale Smelt Mill. A central water wheel drives mechanical bellows which fed a supply of air to the factory's ore hearths. Fumes from the furnaces used to burn off sulphur and other impurities in the lead ore, are carried away from the factory by a complex network of flues. A complex network of flues carried the toxic fumes away from the site but were also a way of ensuring every last bit of lead was collected. As the fumes cooled, lead and silver particles condensed on the walls. The mill shut down its smelting operations in order for this ‘fume’ to be scraped off and collected from time to time. The final part of the lead smelting process was to separate out silver. Although it is only a tiny part of lead ore, its value still made it worth the effort of extracting. The silver was separated from the lead in a separate part of the mill by melting it in a line of pots, each about five or six feet across. Detailed cutaway view of building where silver was separated from the lead by melting it in a series of pans. As it melted the purified molten lead was ladled into moulds to cool into bars of lead called ‘pigs’ and were then transported down the valley to Newcastle, to be shipped to the rest of the country, or exported overseas. My reconstructions are to be mounted on new interpretation boards and these will be installed on site at Allendale Mill and at Allenheads mine yard. 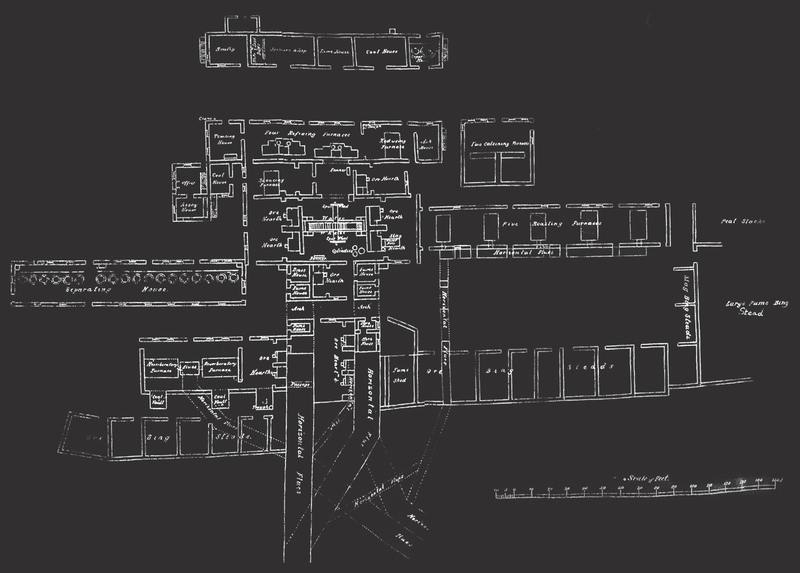 This is the only plan drawing we have of Allen Smelt Mill in the 1800s showing the layout of its buildings and the route of its horizontal flues. 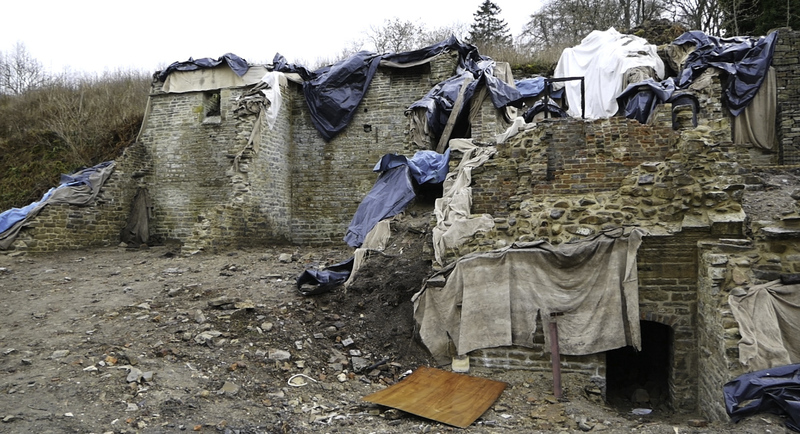 The ore hearths and flue openings are all that remains of Allen Smelt Mill today. The remains of a fire pit - which belonged to one of the many furnaces at Allendale Mill. The equipment for washing the iron ore of unwanted material were called 'Brunton Buddles'. I made a 3D model of these to try and understand how they functioned. Material was loaded through a hopper at the top and then passed on to a canvas belt where water washed away the unwanted material leaving lead-rich ore to drop into a large tank for collection.